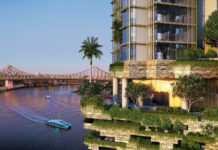 Brisbane’s historic Cleveland Point will soon welcome a residential development located at 45-47 North St, Cleveland which has been designed by architecture firm The Buchan Group and showcases Queensland’s oldest and largest Banyan Fig tree. Upon completion, the residential complex will consist of 33 boutique apartments, with varied balconies arranged strategically to create complementary reflections and shadows on the building’s facade. 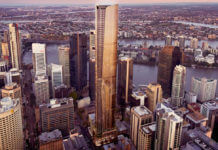 The Buchan Group Director Gerry Holmes said the new development had been carefully designed to integrate with the heritage-listed tree and the building’s coastal fringe surroundings. “The majestic Banyan Fig tree on site has a 12-metre trunk with an extensive root system underneath, so it was important for us to develop a design that would not impact the tree, both now and in the future,” he said. “The building has been significantly set back from the streetscape to provide a buffer between the tree and the apartments and to ensure a generous landscaped area adjacent to North Street’s pedestrian link. In adding to the Banyan Tree, North Street is also home to Queensland’s oldest licensed hotel, the heritage-listed Grand View Hotel. Mr Holmes said the proposed residential development has been designed and sited using a form and scale that complements the Grand View Hotel. “The design pays tribute to the surrounding urban, historical and coastal context of the area, whilst enhancing the visual amenity of the site for residents, visitors and the local community,” he said. “The upper floor of the complex is terraced to soften the building’s impact from the street. This design strategy reduces the visual bulk of the building and also allows the project to sit comfortably in the surrounding landscape. “The orientation of the building gives each apartment more than one aspect to take advantage of cross-ventilation and also includes balconies on both the north and south façades of the building. “This allows residents access to the views north towards Moreton Bay as well as uninterrupted southern views of GJ Walter Park and the adjoining Moreton Bay beyond.